Living in Jerusalem, we participate in a lot of worship services. 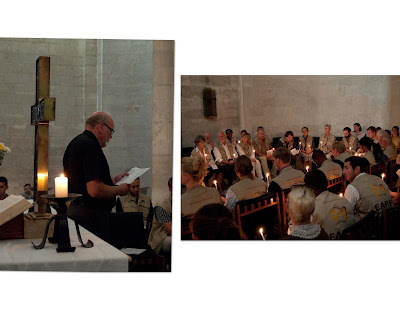 Perhaps most meaningful has been a Handing Over Service for the Ecumenical Accompaniers. 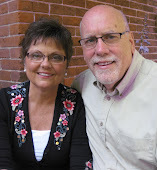 These volunteers come from all over the world for three months at a time. When one group's time ends, the torch is passed to the next group of 27. 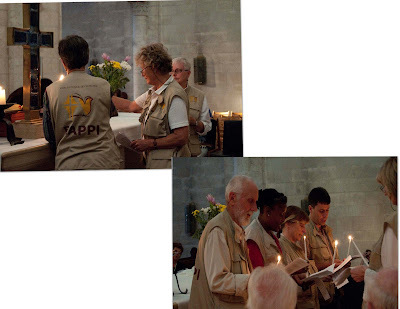 Since the Ecumenical Accompaniment program was started in 2001 there have been 37 groups. Darkness clouded this land when the accompaniment program began in 2001-- in the midst of the second Intifadah. Proposals from around the world suggested that UN Peacekeepers were the answer to put a check on violence. Yet politically motivated vetoes have a way of blocking peacemaking plans. So the Jerusalem churches stepped in requesting the World Council of Churches to send peacemakers. And the EAPPI volunteers have been a light in this difficult situation. Candles lit by those retiring pass on the light to the newly arrived. Ecumenical accompaniers belong to all denominations. As you can see from the photos, a good number are retirement age and may well provide the most effective witness. The accompaniers are most effective when they are noticed. 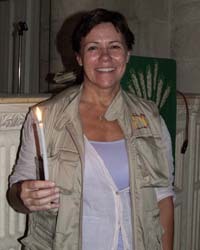 So they all wear a tan-colored vest with a yellow dove and the letters EAPPI-- Ecumenical Accompaniment Programme in Palestine and Israel. 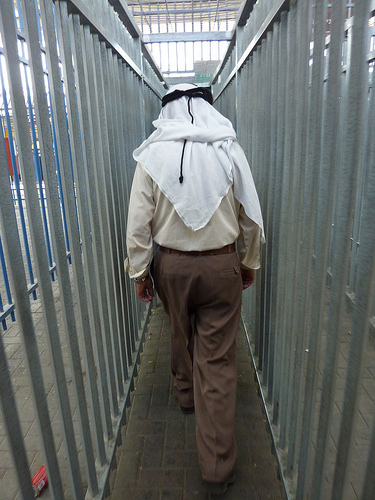 Last week Tuesday, Gloria went with Donna at 5:00 a.m. to the Qalandia Checkpoint where residents have to cross into Jerusalem. Palestinians begin lining up at 4:00 a.m. in hopes of getting through more quickly to work, school, or the hospital. These are the lucky few who can get permits, the ones whose reputations have proven them to be no risk to Israel. 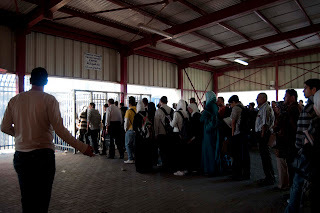 Still it is a humiliating and time-consuming ordeal that these Palestinians have to go through two times each day, six days a week, 52 weeks every year. 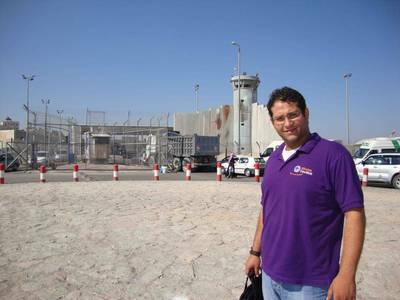 Ashraf Tannous is the Vicar of our Arabic congregation at Redeemer in Jerusalem. Here he is last September as he begins his twice-daily two hour commute from his home in Ramallah, what used to be a 15-minute drive. And Ashraf has a VIP pass. We are privileged with our U.S. Passports to drive through with somewhat limited questioning, still usually a wait of a half hour. Donna has a sophisticated counter, that keeps track of how many individuals are allowed through the maze of "cattle stalls" each hour, how many men, women, and children--every possible category. This way they know when soldiers are unnecessarily delaying the process-- whether by orders from above, or by personal whim. Reports are filed with the authorites. Sometimes the accompanier makes a phone call to the authorities to ask why. On Tuesday, the humanitarian lane was closed for no reason at all. People were turned back, right and left. A woman with a permit to bring her child for dialysis at August Victoria Hospital was denied passage without explanation. She came to Donna in tears and Donna filed her report, while the soldier stood by laughing. The mission of the ecumenical accompanier can be frustrating, but heed the words of Paul's epistle lesson this morning, "Do not grow weary in doing what is right!" Sometimes there are even minor victories. 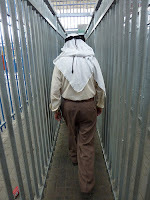 This morning at church Donna reported that the humanitarian lane was once again open--thanks to those 5:00 a.m. visits to Qalandia to accompany Palestinians through this daily ordeal. So you'd like to learn more about how you can be an Ecumenical Accompanier?